OpenNebula is 8 Years Old! After the release of OpenNebula 4.14.2, we are incredibly proud to be able to celebrate the 8th birthday of the OpenNebula Project. Our open source cloud management platform celebrates its eight birthday and looks to the release of major version 5.0 in 2016. Eight years ago, we announced the OpenNebula.org open-source community project. Since then, we’ve seen our user base grow from a handful to one of the most vibrant user communities around. We can’t tell you how much it means to us that so many people have invested time to help us improve OpenNebula – every issue filed, every bug solved, every requested and every question submitted was a gift freely given by each and every one of you to each other, and we are grateful for it. OpenNebula would not be OpenNebula without you. We are excited to see what the next year will bring. https://opennebula.org/wp-content/uploads/2018/11/opennebula_cloud_logo_white_bg-4.png 0 0 Ignacio M. Llorente https://opennebula.org/wp-content/uploads/2018/11/opennebula_cloud_logo_white_bg-4.png Ignacio M. Llorente2015-11-27 12:52:462015-11-27 12:52:46OpenNebula is 8 Years Old! OneGate token is now retrieved from VMwareTools and the EC2 metadata server, enabling instances running in vCenter and EC2 to interact with OneGate. From now on the context packages are splitted in two, the version you’ll use in kvm, vcenter or xen VMs and other for EC2 instances. You can download these packages in its github release page. We are pleased to announce a new release of AppMarket. Release 2.1.0 solves issues reported by the community and has been verified to work with OpenNebula 4.14.2 and the new Sunstone design. https://opennebula.org/wp-content/uploads/2018/11/opennebula_cloud_logo_white_bg-4.png 0 0 Daniel Molina https://opennebula.org/wp-content/uploads/2018/11/opennebula_cloud_logo_white_bg-4.png Daniel Molina2015-11-26 12:08:102015-11-26 12:08:10AppMarket 2.1.0 released! The OpenNebula team is proud to announce a new maintenance release of OpenNebula 4.14.2 Great A’Tuin. This release comes with several bug fixes found after the 4.14 release. These bug fixes covers different OpenNebula components like the Cloud View self service portal, Sunstone web interface, OpenNebula Core and several drivers (VM, IM, Network, Auth), as well as with the OneGate component. Check the full list of bug fixes in the development portal. Extend list of Cloud View available operations, to include snapshots, nic and disk hotplugging, schedule actions and rename. Additionally, make the list of available operations customizable. Allow template substitutions in PUBLIC_CLOUD sections. Monitoring through CloudWatch for EC2 VMs. Quiesce support for qcow2 disks. UserData for EC2 available as User Input. Add context support for EC2 instances. Import SoftLayer VMs with FQDN as name instead of deploy id. Update econe server to support Signature Version 4. Improved import resources dialog for vCenter, including pagination. Better support for external tabs. Improved Sunstone update avoiding cache issues. Support for VMware customization specs in vCenter. Better network information display for vCenter. Name in vCenter VMs for aid in VM identification. Prefix resources with cluster names in vCenter. Multi vCenter cluster VM templates support. OneGate support for vCenter and EC2. Improvements in documentation: ssh timeouts, vnet permissions and Ceph. If you haven’t had the chance so far to try OpenNebula 4.14, now is the time to download and install OpenNebula 4.14.2 Great A’Tuin. The team have also updated the Sanboxes if you want to take Great A’Tuin for a test drive. As as highlight, find below a screencast describing the new import feature that allows importing VMs running in public cloud providers, vCenter, XEN and KVM environments to be managed through OpenNebula. The team is working on a new version of the Marketplace compatible with 4.14.2, as well as a new set of context packages. A couple of weeks ago, we celebrated OpenNebulaConf 2015, three days packed with interesting talks and great experiences exchange. It was a great success thanks to the support and participation of all of our community members, speakers, sponsors and friends. The third OpenNebulaConf was a great success. Great location, great people, great experiences exchange an great food! Check the Outreach section for the aftermath and stay tuned because in a few days we will publish the photos, slides and videos of the presentations. Autumn is here! Leafs are falling, rains from time to time and it’s getting cold. So the OpenNebula team has decided to lock themselves up and prepare a worthy maintenance release for Great A’Tuin, the 4.14.2. It will come with a lot of bugfixes and several features. But don’t worry, we will be extra careful to ensure compatibility, specially taking into account that it is a maintenance release after all. For instance, 4.14.2 will bring improvements in the hybrid connectors the ability to substitute PUBLIC_CLOUD attributes á la context, extract monitoring information (CPU and Networking) from EC2 Virtual Machines through the use of CloudWatch and User Data for EC2 will be available as a Sunstone user input (that is requested from the end user at the time on instantiating a Virtual Machine). 4.14.2 will also bring important improvements to vCenter integration. Large scale deployments will benefit from the pagination of vCenter import dialog, as well as multi-cluster VM templates. An important addition is also the integration with VMware guest customization, which leverages the guest OS support for customization that traditionally exists on VMware infrastructures. Also, Sunstone will bring good news for developers, with accommodations to ease third party integrations, like the improvement of the mechanism to add external tabs. You can check the complete list of changes in the development portal. We see the benefits in Docker, and want to help our admins to deploy their favorite Docker shipped appliances in their OpenNebula infrastructures. That’s why we have integrated OpenNebula within Docker Machine. This allows you to experience the best of both worlds: by using Docker with OpenNebula developers will use Docker transparently, but OpenNebula admins can control where these VMs are executed. The AppMarket is getting its share of love, and a new version will be published in a few days with full compatibility with OpenNebula 4.14.2, as soon as the maintenance release is out. The team has also released a new version (1.8) of vOneCloud. This new release of the appliance, based on a tailored version of OpenNebula 4.14 Great A’Tuin to ease the provisioning of resources from vSphere based infrastructures, comes packed with exciting new features, like the ability to configure the deletion of disks after finishing the VM lifecycle, friendly VM display name in vCenter, better naming on resource import and improvements in the Control Panel to further configure the vOneCloud appliance. The OpenNebula community was busy this month attending the OpenNebula Conference. But those that couldn’t make it, where also active in other ways. Our friends at BlackBerry announced recently announced a new chef driver for OpenNebula. This driver comes with additional chef resources to manage OpenNebula: templates, images, vnets and leases! Also worth noting that our friends and OpenNebula users at Harvard are hard at work designing their OpenNebula based infrastructure. It will definitely work!! People are also growing fond of vOneCloud, and lot of new users are coming due to our participation in the VMworld. More details in the next section. One very important aspect of software development is maintenance. We understand this in the OpenNebula project, and do our best to keep a steady release cycle, provide a migration path and, specially, keep backwards compatibility. For this reason, we appreciate that our add-on ecosystem follows the same principles, like the lxcone set of drivers, that recently announced a new version. 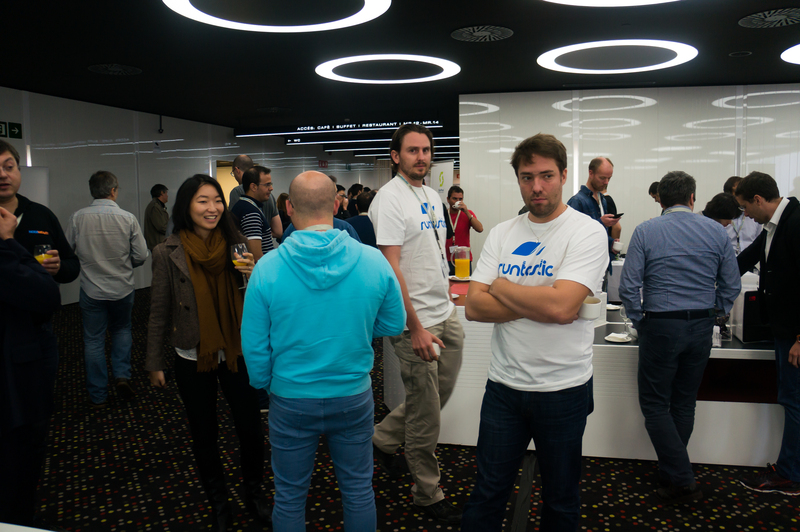 The third OpenNebula Conference was a great success! We love our community, seriously guys, you rock big time. Three days packed with interesting talks and great experiences exchange in the ‘hall track’. 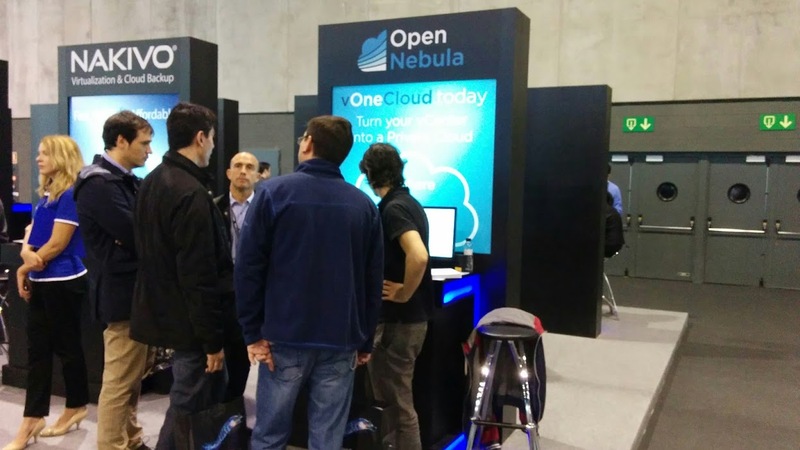 A great set of sponsors showed their integrations and use of OpenNebula, and their added value. We hope you liked the organization and the venue, and of course, the choice of food and places for the social events. We had a blast organizing it, and all the team feels it was a productive event for the attendees. Let’s hope we are right, we are willing to see you next year! We would like to take this opportunity to also thank our Platinum Sponsors PTisp and StorPool; Gold Sponsors ungleich (check out their summary of the conference), Xen Server and NodeWeaver; and Silver Sponsors Runtastic and No Limit Network. We uploaded the slides of the talks and you can find here the pictures of the conference. Check out the great keynotes of Unity and Runtastic, the to-the-point (as always) and hugely amusing talk by Carlo Daffara, the BlackBerry lightning talk … a wealth of information if you are running or planning to run an OpenNebula cloud. Videos will be available soon, stay tuned! Colocated with the OpenNebula Conf was a new edition of the CentOS Dojo. Check out the agenda, you can find the slides and videos of the talks in the CentOS wiki. The team was also present in the VMworld Europe 2015 in Barcelona. A great event, where we introduced vOneCloud 1.8, the open replacement for vCloud director. It was awesomely well received, we hope it accommodates a wide range of use cases.